You will receive my high quality Out of Sight Litter Box® packaged in a foam lined, multiple walled shipping box that is also MADE IN AMERICA and was engineered to protect my product and to withstand the some times rough shipping process. Other companies that import, package with poorly manufactured single wall soft cardboard. I have invested a lot of time, money and testing in my packaging design and materials so my product will arrive safe to you. 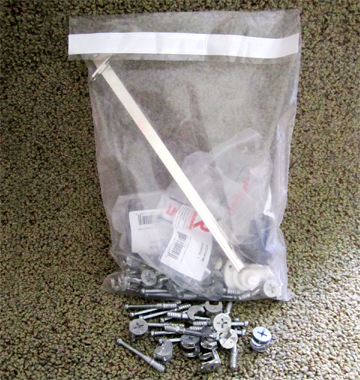 I include all necessary hardware, even a few extra pieces, just in case, for the assembly of my Out of Sight Litter Box® cabinet. Special hardware like the Top Lid stay keep the Top Lid in the open position while scooping. Also my Top Lid support bumpers are custom made with neoprene rubber washers that cushion the Top Lid closing with a soft “bonk” sound. My finished back panel allows the cabinet to be free standing, no longer does the cabinet have to be located against a wall, it can now be placed anywhere in a room. (Cheaper cabinets usually use nailed on cardboard for the back.) My front, and back panels have been designed to allow air flow and light into the cat litter pan cabinet area. 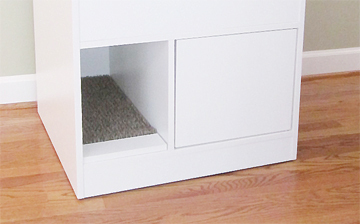 Two (2) High-Sider™ Litter Boxes are included with your cabinet purchase. Compare the 15 inch tall High-Sider™ Litter Box to a common 4 inch tall litter pan in photo below. My High-Sider™ Litter “Box” is a BOX, corrugated WAX saturated cardboard litter “box”… I can’t lie, I can’t come up with some fancy “other name” for what the litter “box” is made out of… so, it is what it is. The custom designed litter box, (23 inches long x 13 inches wide and 15 inches tall – no more “missing” over the edge) it fits in my Out of Sight Litter Box® cabinet. The wax saturated cardboard is moisture resistant, the walls (sides) and the bottom (insert) are both wax saturated, the tray is wax coated on the inside. My High-Sider™ litter box assembles easily, the three layers overlap into a leak proof system. I like it better than any of the plastic ones I’ve ever used! The bottom is flat, and the walls are 90 degrees vertical. Replacements are sold in pairs on the Accessories Page. I have 4 cats that tested one litter box, and it was in great shape after six months use, if you only have one cat… that would equate to lasting more than one year. It works! No smells. No leaks. No problems. The High-Sider™ Litter Box is great for multi-cat households. Also great to use as a stand alone litter box (with no cabinet) while traveling. Note: These litter boxes are too large and DO NOT fit in my older (smaller) cabinets ordered before 2015. My patented unique cat litter furniture cabinet has been designed to be easy to assemble. 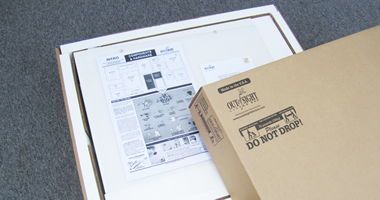 My Out of Sight Litter Box® cabinet is shipped KDF – knock down flat. Just follow the simple step-by-step photo assembly instructions that clearly show, and explain each step. My wife was the assembly ginny-pig, it took her just over an hour to assemble the cabinet, and that was without my help. All you will need is a Phillips screwdriver and a small hammer, and maybe your fist. 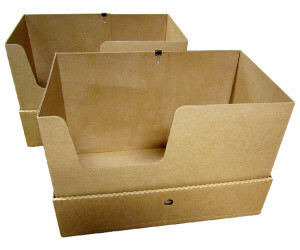 Two TraxTurf™ mats are included with each cat litter furniture cabinet package order. TraxTurf™ is a soft and flexible grass like mat that I incorporate and patented in two locations of my Out of Sight Litter Box® to remove kitty litter from your cats paws. TraxTurf™ traps and holds cat litter that would otherwise be tracked throughout your home or apartment. My TraxTurf™ is the highest quality, the real deal, purchased directly from the patented manufacturer of Astro-turf®. TraxTurf™ is easy on your cats paws and easy to clean. You will be surprised when you pick up the TraxTruf™ mats and shake out (recycle) all the collected kitty litter back into the cat litter box. If ever soiled, just wash the TraxTurf™ with soapy water, let dry (put them in the sun) and replace. TraxTurf™ will last for years of daily use. Replacements available on the Accessories Page. Pet urine starts to smell like ammonia very quickly. Bacteria starts breaking urine down immediately, urine contains nitrates, which are the essential building blocks of ammonia. And the ammonia is what smells. What neutralizes ammonia? Baking Soda! Baking Soda’s deodorization power is a result of its ability to absorb and neutralize odor, rather than only covering it up. My baking soda box holder mounts (screws are included) under the Top Lid, each time the Top Lid is opened, the baking soda is mixed. 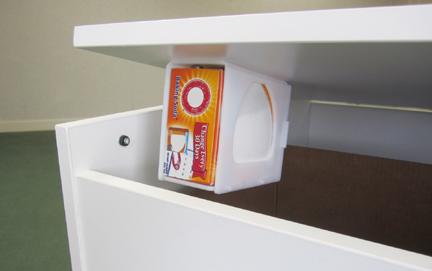 A baking soda box slides in and out of the holder easily for replacement. 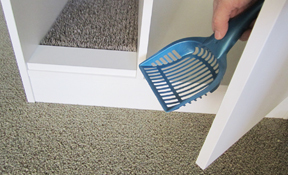 My Odor Absorber can be used with any litter box cabinet. You will need to pick up a few “@rm and [email protected] firdg and frezor” baking soda boxes (they won’t let me use their brand name) to use with the holder. (Box of baking soda NOT included – they won’t let me include one either.) The fact is, cat poop stinks! Most cats cover up, some “dump and run”. Nothing is going to get rid of that odor except by removing and getting ride of the poop. Keeping the litter box clean is essential. My Out of Sight Litter Box® is designed to be easy to clean. It takes only a minute in the morning and a minute at night, just walk up, open the Top Lid, scoop, and walk away. Your cat’s and your nose will both be happy. I have made many improvements in my cabinet since day one in 2003. Each “start over” (read the My Story Page) has seen improvements in design and quality. The cabinet panels are now 5/8 inch thick which allows use of hidden pins and cams for assembly. The back panel has been upgraded, it is made from the same panels as all the others, and makes the back look as good as the front. This allows the cabinet to be free standing, no longer does it have to be located against a wall, it can now be placed anywhere in a room. (Cheaper cabinets usually use nailed on cardboard for the back.) 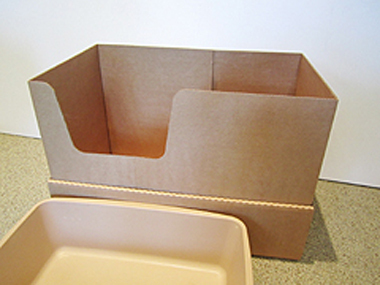 My front and back panels have been designed to allow air flow and light into the cat litter pan cabinet area. The high grade California approved plastic coat melamine surface allows easy cleaning and repels litter box “misses” for hours. All of my panel edges are “edge banded” to help seal them from moisture absorption. Even the “blind” edges of my panels that you don’t see after assembly are edge banded. Most of the less expensive litter cabinets on the market leave the blind edges unbanned or coated. It costs more for the edge banding process, but it is worth the extra cost. Most of the less expensive litter cabinets on the market do not edge band or coat the “blind” edges. When a litter pan “miss” happens, that moisture seeps and is absorbed into the panel edge. That smell, will never go away, that less expensive cabinet is now, trash. Quality control and high-quality manufacturing is paramount for me. My panel manufacturer believes in my product and respects my years of effort and that shows in their quality control of each panel. I am so proud and confident with all involved in producing my Out of Sight Litter Box®… I totally feel good and at peace with the high-quality of my Out of Sight Litter Box®. Also included with your cabinet package purchase is a free litter scoop. Sized to fit in your hand just right, not too big, so to make scooping easy and efficient. It hides away in the storage area. I recommend a good quality clumping litter be used with my Out of Sight Litter Box®. I have received many emails about how well the new crystal litters work as well as the natural pine type litters too. It is important that you remove cat litter waste areas daily, and dispose in an appropriate manner. (I recommend using your old plastic grocery bags to scoop clumps and waste in to, then knot closed and discard properly.) From time to time the litter collected by the TraxTurf™ mats will need to be emptied (recycled) into the litter box. During those times, any stray litter particles can be removed by vacuum or small brush. 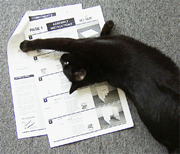 The coated cardboard litter boxes (include with your cabinet purchase) can be replaced about every six months, or when needed, scoop out litter to make box weigh less before lifting out of cabinet. If you purchased the plastic High-Sider™ litter pan, clean it with with warm water and a mild detergent between litter changes. 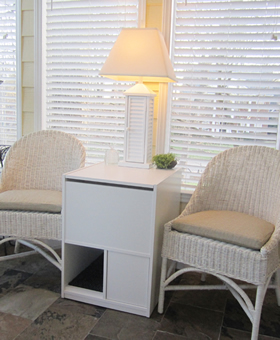 My Out of Sight Litter Box® cabinet can be cleaned as any furniture, with a mild non-abrasive household cleaner or furniture polish.